Association newsletters July-December 2000 under Greg Lorton's editorship. Association newsletters January 2000-June 2000 under Greg Lorton's editorship. March 2000 issue is missing. Association newsletters January 1999-June 1999 under Greg Lorton's editorship. Note issue is missing for March 1999. Association newsletters Ju;y 1998-December 1998 under Greg Lorton's editorship. Association newsletters January 1998-June 1998 under Greg Lorton's editorship. Association newsletters June 1997-December 1997 under Greg Lorton's editorship. Association newsletters January 1997-June 1997 under Greg Lorton's editorship. Association newsletters for October, November and December 1996 under Greg Lorton's editorship. Contents in process. Second of two scrapbooks loaned for scanning by Green Flash Brewing of San Diego. Contains advertising media and beer cartons. Contents in process. Some content loaded. One of two scrapbooks loaned for scanning by Green Flash Brewing of San Diego. Contains advertising proof sheets, label art and various advertising media. Currently in process. 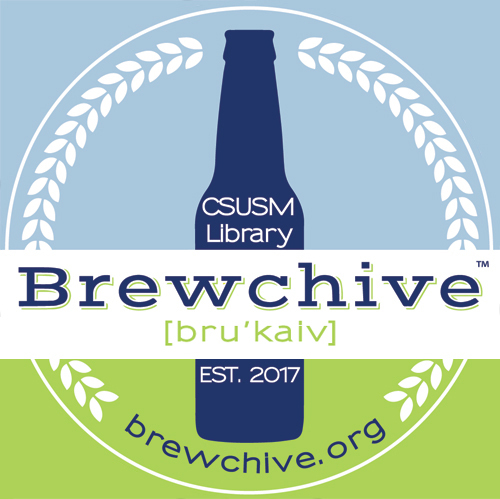 Oral history by Greg Lorton recorded 2017-05-30 at California State University San Marcos. Lorton is a homebrewer and former president of QUAFF. Currently in process. Oral history by Stephanie Eppig recorded 2017-06-27 at J&L Eppig Brewing. Eppig is the co-founder and co-owner of the brewery, named after family members who brewed during Prohibition. Currently in process. Oral history by Alec Johnson recorded 2017-07-05 at Shirts on Tap, San Diego. Johnson is the co-founder and co-owner of Shirts on Tap, a shirt-of-the-month subscription service. Currently in process. Oral history by Pat and Val McIlhenney recorded 2017-07-07 at Alpine Tavern in Alpine, CA. They founded Alpine Beer Company and Pat started with homebrewing and was a member of QUAFF. Currently in process. Oral history by Lynda Cull recorded 2017-05-11 at Stone World Bistro and Gardens, Escondido, CA. Cull is a homebrewer and financial consultant specializing in the beer industry. Currently in process. Oral history by Amy Spackman recorded 2017-02-23 at Mission Brewery. At the time of the interview, Spackman was the Mission Brewery Tour Director. She is now in a similar position at Karl Strauss Brewing. Currently in process. Oral history by Virginia Morrison recorded 2017-03-17 at Second Chance Beer Company, San Diego, CA. Morrison is the co-founder and co-owner of Second Chance Beer Company with her husband/brewer Marty Mendiola. Currently being processed. Oral history recorded 2017-08-01 at offices of Moore & Skilijan in Carlsbad, CA. Moore is member and general counsel for the San Diego Brewers Guild.